Scrumptious muffins are a delightful way to start the day. 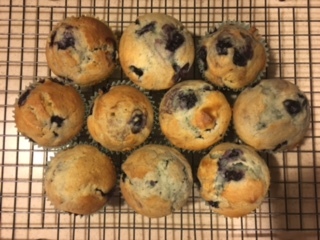 Muffins can be eaten for breakfast, snack, or even desert. They are one of my favorite treats, and are super easy to make. In fact, this recipe only takes about 30 minutes to complete. Grease 30 muffin cups or line with paper muffin holders. In a large bowl, beat eggs, and slowly add sugar while beating. Next, keep on beating while gradually pouring in oil. Mix in the vanilla. Combine the dry ingredients into the egg mixture alternately with sour cream. Carefully fold in the blueberries. Scoop the batter into prepared muffin cups (fill about ⅔ full). This recipe is simply scrumptious, and will surely cure your starving stomach.